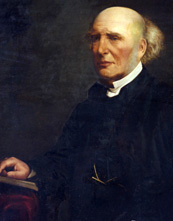 Humphrey Lloyd was born in Dublin, the son of Provost Bartholomew Lloyd, at that time a Junior Fellow.1 He won a gold medal at graduation in 1820, and was elected to Fellowship in 1824. In 1831 he succeeded his father as Professor of Natural and Experimental Philosophy. He held the chair until 1843, when he became a Senior Fellow. In 1867 he was appointed Provost. He was a physicist of considerable achievement, especially in the fields of optics and terrestrial magnetism, and was also the main force behind the foundation of the Engineering School in 1841. He was probably the most distinguished scholar to hold the office since Narcissus Marsh was elected Provost in 1679.2 He was a Fellow of the Royal Society, held an honorary doctorate from Oxford and had been President of the British Association as well as the Royal Irish Academy. Lloyd was in advance of his time in the importance he attached to research as a function of the University. He died in his eighty first year in 1881. Anne Crookshank and David Webb, Paintings and Sculptures in Trinity College Dublin (Dublin, 1990), p. 85. J.V. Luce, Trinity College Dublin, The First 400 Years (Dublin, 1992), p. 100-1.